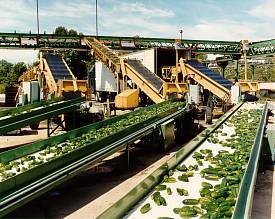 We process the finest-quality, freshly harvested premium raw pickling cucumbers. Bay View's facility includes capability for washing, grading, sorting, and brining. We can wash, sort, grade and prep field-fresh stock for cold bulk shipment or if you want us to brine your stock we can do that too. We can brine your stock in our house recipe or to any custom formulation you desire. Here at Bay View our huge tank field can hold your pickles for just-in-time delivery to your plant. Why can you count on Bay View to be a dependable source for the highest quality fresh, brine or custom stock pickling cucumbers? Northeastern lower Michigan's rich soil promotes a quality plant and fruit. Our proximity to the Saginaw Bay on Lake Huron gives us a longer growing season of hot days and cool summer nights, which also helps to produce a better-quality fruit. Most of our growers are in the basin of Michigan's largest watershed. In fact, in our worst year in half a century, we were still able to bring in 70 percent of our projected crop yield. We have one of the fastest field-to-fermentation times in the industry: 12 to 36 hours faster than the competition. This speed translates into a better, fresher-tasting product for you and your customers. In any given season, we have hundreds of growers growing countless varieties. But our electronic tracing allows us to pinpoint the grower, field, seed variety and the quality in each tank and truck that enters our facility. Our strict quality controls, measuring everything from seed varieties planted to salts and calcium levels during the brining process, mean you can count on us for consistent taste, order to order, batch to batch - whether the brining and flavor recipe is yours or ours.